An international tribunal ruled on Thursday it had the power to hear a case brought by the Philippines over disputed islands in the South China Sea, in a move likely to trigger fury in Beijing. THE HAGUE: An international tribunal ruled on Thursday (Oct 29) it had the power to hear a case brought by the Philippines over disputed islands in the South China Sea, in a move likely to trigger fury in Beijing. Manila has insisted the UN Convention on the Law of the Sea, which the Philippines and China have both ratified, should be used to resolve the bitter territorial row over isolated reefs and islets, which has triggered growing international alarm. But China has refused to participate in the proceedings, arguing the Permanent Court of Arbitration - which is more than a century old and based in The Hague - had no jurisdiction over the case. "Reviewing the claims submitted by the Philippines, the tribunal has rejected the argument" by China that the "dispute is actually about sovereignty over the islands in the South China Sea and therefore beyond the tribunal's jurisdiction," the court said in a statement. Instead, the court ruled the case reflects "disputes between the two states concerning the interpretation or application of the Convention" - something which falls within its remit. China insists it has sovereign rights to nearly all of the South China Sea, a strategic waterway through which about a third of all the world's traded oil passes. The tribunal - set up in 1899 to resolve international disputes between countries - stressed on Thursday its ruling did not yet go to the heart of the merits of Manila's case, which was first filed in 2013. A new hearing will now be held behind closed doors in The Hague, and a final ruling is not expected until next year. The tribunal agreed it would take up seven of the 15 submissions made by Manila, in particular whether Scarborough Shoal and low-tide areas like Mischief Reef can be considered islands, as China contends. It will also mull whether China has interfered with Philippine fishing activities at Scarborough Shoal. But it set aside seven more pointed claims, mainly accusing Beijing of acting unlawfully, to be considered at the next hearing on the actual merits of Manila's case. In a July hearing in the Hague, Philippine Foreign Secretary Albert del Rosario warned the integrity of UN maritime laws was at stake. China's behaviour had become increasingly "aggressive" and negotiations had proved futile, del Rosario said. But the court on Thursday also directed Manila to narrow down the scope of its final request that it should order that "China shall desist from further unlawful claims and activities." China has said it will not abide by any ruling. But the Philippines hopes a judgement in its favour will pressure China into making concessions. The tribunal said Thursday's ruling establishing its competence in the affair had been "unanimous" among the panel of five judges. And it stressed the ruling "concerns only whether the tribunal has jurisdiction to consider the Philippines' claims and whether such claims are admissible." China's Foreign Ministry said the warship "illegally" entered Chinese waters, calling the US action "deliberate provocations". Subi and Mischief are part of a chain of seven massive islands that China has created across the Spratly archipelago. The United States has expressed concern that these islands, with their air strips and mall-size garrisons, will allow China to control the US$5 trillion (S$7 trillion) in trade that passes through the South China Sea annually. China claims nearly the whole area, which the Philippines, Vietnam, Malaysia, Brunei and Taiwan are challenging. A US warship sailed through disputed waters near a Chinese- claimed island in the South China Sea yesterday, turning months of verbal sparring over Beijing's land reclamation in the region into a direct military challenge. The move drew a swift rebuke from China, raising tensions between the two powers ahead of meetings at a pair of regional summits in the coming months. China's Foreign Ministry expressed "strong dissatisfaction" with the US action, and its Defence Ministry called the US "irresponsible" and said it would take all necessary measures to safeguard national security. The USS Lassen (right) with a Republic of Korea Navy ship during an exercise east of the Korean Peninsula in March. The US vessel yesterday went within 12 nautical miles of islands China has built on the Subi and Mischief reefs. 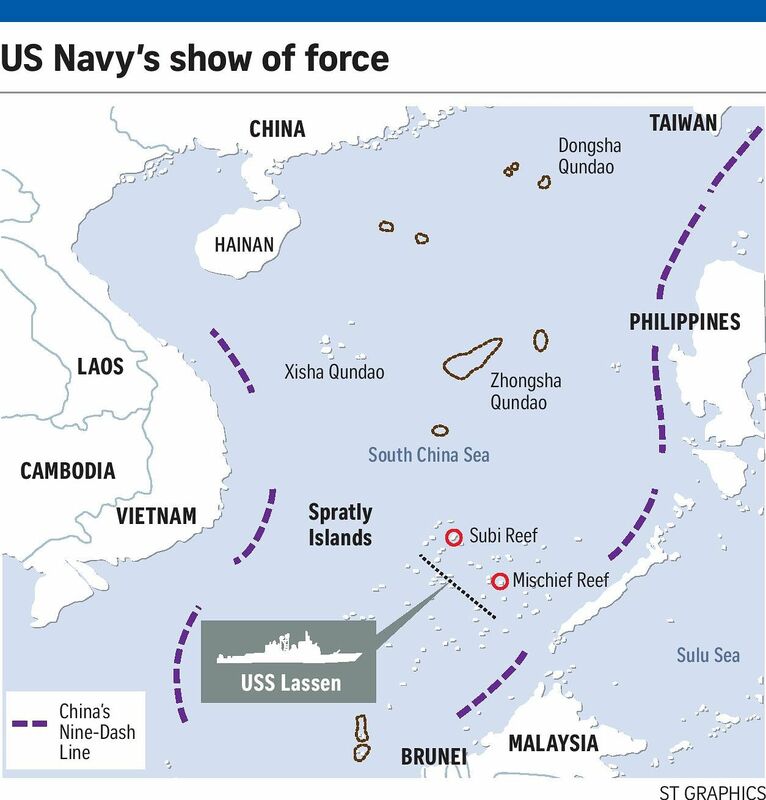 At around 6.40am yesterday, the USS Lassen guided-missile destroyer began a run that took it within 12 nautical miles of the Subi reef - crossing into what would be Chinese territory if the United States recognised the man-made island. The mission was intended to make the point that Chinese land reclamation in the South China Sea should not affect freedom of navigation. In 2013, Washington flew two bombers over the disputed Senkaku/Diaoyu Islands in the East China Sea in direct violation of a new air defence identification zone established by Beijing. It was unclear if Washington had spoken to Beijing before yesterday's mission, though US State Department spokesman John Kirby stressed that nations do not need to consult each other when sailing through international waters. The Chinese authorities followed, monitored and warned the US vessel following what it described as "illegal entry" into the waters, Foreign Ministry spokesman Lu Kang said in a statement posted on the ministry website. "China expresses its strong dissatisfaction and resolute opposition," Mr Lu said, stressing that China's construction works do not affect freedom of navigation or flight in the South China Sea . Chinese Foreign Minister Wang Yi earlier warned the US to "think carefully before acting, not to take reckless action and not to make trouble out of nothing". The Chinese government summoned the US Ambassador to China, Mr Max Baucus, over the matter. Philippine President Benigno Aquino, whose country also has claims in the region, said he saw no issue with the US operation. The voyage was lauded by Washington pundits who had pushed for such an operation since the beginning of the year when US concerns started to grow about the pace of Chinese land reclamation in the disputed waters.